It gives me great pleasure and is a great honor to be among the first to officially “Welcome” Earth and all of Her inhabitants into this Great Galactic and Universal Community. 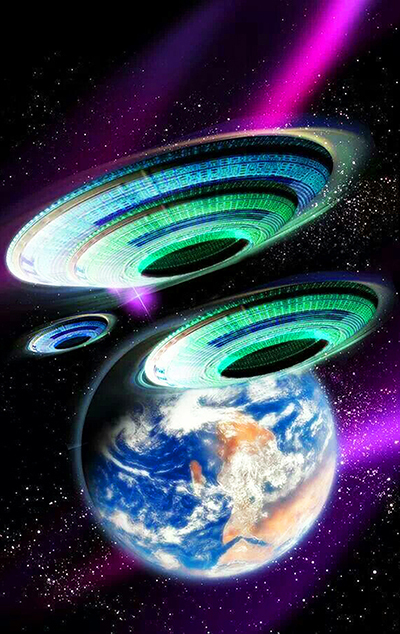 On behalf and in representation of the Galactic Federation of Light and Ashtar Command, Welcome Home Dear Brothers and Sisters of Earth! With arms and Hearts open wide, Welcome Home to Your Family of Light! It is time now, and soon we will be making Worldwide Contact with our Beloved Family from the Stars. It is not insomuch that THEY have finally arrived ~ they’ve actually been here waiting for US for a long time now. It is more that WE have finally arrived at this moment of mass awakening, wherein we are finally remembering who and what we really are and where we come from. This enables us to fully attune to the vibration/frequency of our Family and why now they are becoming “visible” to so many of us! There is so much going on now; so many of us who are recalling and recounting all of our experiences we’ve had throughout our lives involving encounters and interactions with our Star Families, all in preparation for these coming days when our understanding and compassion would be needed in order to assist the newly awaked through events which are about to occur; events which will change forever the course of our civilization for the better. Facts that had never seen the light of day until now have been slowly rolling out of the proverbial closet, soon to be followed by more staggering and mind-blowing facts and events, which will leave us at once gasping in amazement and breathing a deep sigh of relief! We have finally arrived at our moment of enlightenment! But what are we to expect now? How will it all unfold? What will it look like? How will it make us feel? Well, to begin with, please don’t expect that there will be any mass hysteria and that people will go running through the streets screaming in fear as some have tried to lead us to believe would happen. Many of us who are already awakened have been specially prepared over a period of many years to prevent exactly that from happening. Yes, there WILL be a mass appearance in the skies by our Galactic Brethren, but it will, as it already has been, take on the appearance of a gradual “unfolding”. Remember that they have actually been here already for a very long time, seemingly “cloaked” and invisible to us for the most part. But as you’ve no doubt noted, especially in more recent times, the increased frequency with which “space craft” have been witnessed in the skies around the world. This is not in effect “their” decision to “show themselves” (they’ve always been visible to person who are attuned to them), but rather more because of our own higher vibrations which so many of us have been working so hard to attain we can now see them. We’re now “tuning in” to the higher vibrations of our unique “Soul Groups” or “Soul Families”. If you have been or are beginning to see orbs and other Light Craft as they briefly light up like tiny flash-bulbs in the sky, or have tracked them as they make their way across the night sky when they suddenly “power-on” and become brighter than any star in the sky (which I might add that both phenomena can be see equally well in day or night - makes no difference) you can know that you’ve just been waved “hello” to by an immediate member of your Star Family ~ you are specifically attuned to their frequency and that is why you can see them! So what does this mean for the coming days and the mass sightings witch pretty much EVERYONE is expecting now? As I understand it, those who are most awake and most “tuned-in” will the first to witness the mass appearance of ships in the skies. And when I say “mass” I really do mean MASS! It will begin gradually but will eventually fill the sky from horizon to horizon in “all 4” directions. The resulting further expansion of your already expanded “heart-lights” will reach out and touch the hearts of all around you beginning with those most awakened. Like candle lighting each other one to the next to the next, and so on, ALL will fully awaken so that they too will see the spectacle in the sky. One after the other after the other heart will be touched until ALL will remember the feeling of ecstatic bliss of fully recalling their Divine True Nature. We all will be resonating the same Universal Love vibration as our Beloved Brothers and Sisters from the Stars and at that moment ALL of us will see the truth shining there before us. There will be no more concealment from us of that which has always been ours! I know that many of you are wondering just what exactly is the nature of these “ships” we are about to be treated to seeing… If I had to choose two words that would describe them best they would be “inexplicably Beautiful”! In a way, they will be exactly what you have been expecting, many appearing as the relatively “conventional” flying-saucer type space craft which so many have reported seeing in their close encounters. Please keep in mind however that not only are there many other shapes and sizes of craft which come in just about every color of the rainbow (many exhibiting multi-colored appearance) and that while some of them may seem to appear as conventional (nuts and bolts) construct, almost all are actually “Living Technology”! They are living beings and exist in symbiotic relationship with their occupants, utilizing their ability to flow and shift in concurrence with their changing needs. Many ships will even look very “organic” to our eyes, appearing as the life forms they truly are. Often times the color, shape and characteristics of the ships are a direct reflection of the mood or state of being of the ships’ occupants. That being said, and accounting for the growing excitement I’ve sensed coming from our Star Families (Galactic Federation of Light and Ashtar Command as well as the many others who are here to participate in and witness these wondrous events), we will be treated to quite a spectacular light show in the very near future! To say that it will be the most amazing “firework” display you have ever seen is an understatement! As I’ve already stated, these Living Ships are sentient beings and have consciousness which they use to interact with and provide for the needs of their occupants and each other much the way that you and I do with and for each other. Many of us will be amazed as we progress, coming to the understanding that we have our own “personal” craft who are attuned to our unique vibration and with whom we share a special bond much the same way as the Dragons and Riders in Ann McCaffrey’s “Dragon Riders of Pern” series (just one example of how TRUTH has been gradually interwoven into the fabric of our consciousness while we have carried out our roles in this lifetime ~ you will no doubt recall other sci-fi/fantasy literature which has incorporated the idea and use of Living Technology and ships, with similar bonds between ships and crew). These ships that you are attuned to are members of your Soul Group or Family (as their inherent consciousness is a Soul also, the same as you are within your Human experience – they are having their current experience as a “ship”) and may or may not include a pilot and/or crew who are also members of your Family. Oh hat a Family Reunion this is going to be!! I really don’t expect there will be much of any kind of official announcements ahead of time other than what you are reading now and other similar articles written by others who are having the same feelings. Let’s face it’; we’ve all been expecting this to one degree or another for quite some time now. You CAN and SHOULD expect, however, many announcements, briefings and introductions to happen both directly prior to and as “landings” are taking place. And yes, there will be landings of specific crafts carrying certain dignitaries at first in order to make proper introductions and informative speeches to the world of what can be expected next. The answers might surprise you – this is not an invasive “takeover” of our unique inalienable rights. This is a CELEBRATION of our uplift-ment and recognition as our being members of the Galactic Federation of Light. It is however US who are just now recognizing ourselves as full-fledged members of this amazing organization ~ our Brothers and Sisters of Light have always recognized our inclusion as Family members, otherwise they wouldn’t be here to assist us now. Their Love and admiration for us and appreciation for all that we have been through to reach this moment runs very deep, and they have the utmost respect and compassion for us. In fact, ALL of the decision making will be left up to the people of Earth as far as what direction to take things in from here on. Our Galactic Family members are merely standing by to provide (now visibly so) assistance as it is needed. After introductions of dignitaries has taken place, then reunion and re-acquaintance with our Soul Groups and Families will begin. Again, oh what a Family Reunion THIS is going to be! If you are anything like me (and I KNOW you are ) I bet you can hardly wait! Please don’t expect me (or anyone else) to give you an exact date for when all of this will take place. I don’t know an exact date. That will be largely determined by the exact moment that enough of us are attuned by our higher vibrations to our Star Families. I simply have a pervasive feeling – a sense that something wonderful is about to happen. I know that many of you reading this have been feeling the same thing. That is probably why you are reading this. You are searching for some sort of confirmation that what you are feeling is being shared by others. And I say emphatically that YES IT IS!! So keep feeling what you are feeling because you are right on the mark! Share your feelings with others so that they too will know that they are right on the mark as well. This will help immensely in keeping the ball rolling, so to speak, right across the finish line! I am also aware that there are still some who may try to refute what is being said here. Some who may claim that this will “never happen”. If that is how you truly feel, you are entitled to your sentiments, but if you feel the need to make your sentiments known, please do it elsewhere. There are many of us who are aware of what it is like to “BE” everywhere, all at once, and as the Masters of Space and “Time” that we are can say irrefutably that these events have ALREADY occurred; THIS REALITY ALREADY exists within the Space-“Time” continuum. No amount of anyone trying to postulate otherwise will change that. So even those who still have a big “question mark” hanging over their heads can think of this as a “done deal” ~ it ALREADY IS, as we have always known it would be! In conclusion, I congratulate all of us!! We’ve ALL arrived at the moment we have all been waiting for! Welcome Home Brothers and Sisters of Earth! !